The Morris University Center was opened in 1967 to provide a place which students could find social, recreational, cultural and educational activities and events beyond academics. Often referred to as ‘the living room’ of campus, the MUC offers everything from a multitude of dining and shopping options, to a recreational center where students can bowl and play pool, arcade games and table tennis. The Morris University Center was built with the concept of using the pre-existing environment to showcase the campus. Brick was used, as it is a material whose appearance varies with natural conditions and glass was added to welcome natural light throughout the building. 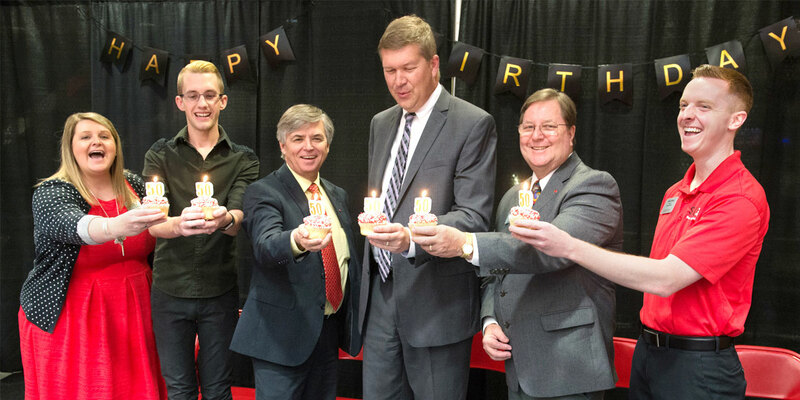 Nicknamed the MUC, the Morris University Center celebrated 50 years in March of 2017. The Morris University Center hosts numerous events and activities throughout the year for students and the surrounding community as part of SIUE’s traditions. At these events, students can enjoy free treats, play games and win prizes. During the school year, the Goshen Lounge serves as the hub for these activities. The MUC encourages student attendance of these events through postings and social media including the MUC Text Club. The Text Club is a service offered to students, faculty, staff, alumni and anyone that wants to stay informed about what’s happening at the MUC. Being part of the text club means you will never miss a giveaway or event. You will always be the first to know about deals on merchandise, food or entertainment. It’s easy to sign up. Simply text ‘MUC’ to 313131 and you will start receiving texts. How can we improve your MUC?